We’d love your help. Let us know what’s wrong with this preview of The Feeling Good Handbook by David D. Burns. With his phenomenally successful Feeling Good: The New Mood Therapy, Dr. David Burns introduced a groundbreaking, drug-free treatment for depression. Now in this long-awaited sequel, he reveals powerful new techniques and provides step-by-step exercises that help you cope with the full range of everyday problems. With an up-to-date section on everything you need to know about commonly prescribed psychiatric drugs and anxiety disorders such as agoraphobia and obsessive-compulsive disorder, this remarkable guide can show you how to feel good about yourself and the people you care about. You will discover that life can be an exhilarating experience. To ask other readers questions about The Feeling Good Handbook, please sign up. how can I get this book in pdf (or free download ) ? Is it a recommend buy if you already read "Feeling good"? اگر از من بپرسید یک کتاب مناسب در زمینه شناخت درمانی که برای عموم مناسب باشد چیست کتاب از حال بد به حال خوب نوشته دکتر دیوید برنز با ترجمه مهدی قره چه داغی پیشنهاد من است. کتاب در زمینه روانشناسی می باشد ؛ نویسنده معتقد است ریشه بسیاری از مشکلات افراد را باید در عدم شناخت کامل آنان از خود دانست. شناخت درمانی مبتنی بر نظریه ساده ای است که می گوید به جای حوادث بیرونی افکار و طرز تلقی های شماست که روحیه ی شما را شکل می دهد. یکی از اصول مهم شناخت درمانی قضیه ای به ظاهر مهمل است و آن اینکه نقطه ضعفهای ش اگر از من بپرسید یک کتاب مناسب در زمینه شناخت درمانی که برای عموم مناسب باشد چیست کتاب از حال بد به حال خوب نوشته دکتر دیوید برنز با ترجمه مهدی قره چه داغی پیشنهاد من است. یکی از اصول مهم شناخت درمانی قضیه ای به ظاهر مهمل است و آن اینکه نقطه ضعفهای شما می تواند نقاط قوت شما گردد.نواقص شما می تواند ، اگر آنها را بپذیرید و بر آنها گردن نهید ، تبدیل به بزرگترین سرمایه های شما شود. با تمریناتی که در هر فصل ارائه شده شاید دستیابی به اهداف یاد شده غیر ممکن نباشد. کتاب شش بخش و ۲۷ فصل دارد ؛ شناخت روحیه ، احساس خوب ،احساس اطمینان ، چگونه با ارتباط بهتر روابط بهتر ایجاد کنیم و.... از مطالبی قابل خواندن در این کتاب است. Unlike with previous Burns books, I read this one while I was feeling relatively normal and untroubled. I did this because I sensed myself relapsing. Cognitive therapy, as you might know, is based on the premise that your thoughts control your moods and emotions. Thus it works by changing your beliefs and even your values in order to alleviate depression, anxiety, and problems with relationships. In my own experience, this can have a remarkably liberating effect. The problem is that, when the re Unlike with previous Burns books, I read this one while I was feeling relatively normal and untroubled. I did this because I sensed myself relapsing. Cognitive therapy, as you might know, is based on the premise that your thoughts control your moods and emotions. Thus it works by changing your beliefs and even your values in order to alleviate depression, anxiety, and problems with relationships. In my own experience, this can have a remarkably liberating effect. The problem is that, when the relief passes and you once more get sucked into the humdrum world of daily troubles, the original beliefs and values come creeping back. It seems to me that the most proactive strategy would be to intervene on the social rather than the psychological realm (if that were possible). To pick a simple example, if an obsession with being the best is really self-defeating—at least as far as happiness is concerned—then why is the opposite message so passionately embraced in the culture at large? Perhaps it is because these value systems, which equate happiness with accomplishment, do benefit the group even if they are not psychologically desirable. An office full of miserable perfectionists might out-compete an office full of contented workers with nothing to prove. Advertisements may not have much effect in a world of high self-esteem. And political parties will have trouble getting elected in a world without anxiety. In these and a thousand other ways, society depends on the very thoughts and attitudes that books like this try to combat. No wonder that relapse is common once therapy ceases. It is also true that there are hidden, and sometimes ugly, benefits to our bad habits. It feels satisfying to think oneself superior to others. Insulting and controlling other people brings a rush. Anxiety helps us to avoid discomfort. Intimacy requires painful vulnerability. And who wants to accept imperfections in oneself? Burns’ methods require that we see ourselves as flawed, that we face our fears, that we acknowledge that other people have a point, that our anger is often unjustified—and who wants to do that? Indeed, sometimes the beliefs that are most precious to us, the beliefs that form our identity and reality, are just what cognitive therapy encourages us to give up—the belief that, for example, your money makes you superior, or that life is rotten, or that your wife is crazy—and these beliefs can seem more important than happiness itself. This book changed my life. I am now able to recognize my mental patterns and decide if they're beneficial to me or not, and discard the unproductive, depressing, anxiety creating thoughts in favor of good thoughts or no thought at all. It's a workbook & the exercises must be done to get the full effect. I recently bought this handbook again because I lost the first one and I realized I'm in need of its way of putting my thoughts on paper and weighing/sorting them out. I recommend this book t This book changed my life. I am now able to recognize my mental patterns and decide if they're beneficial to me or not, and discard the unproductive, depressing, anxiety creating thoughts in favor of good thoughts or no thought at all. It's a workbook & the exercises must be done to get the full effect. I am not ashamed of reading self-help books, or of liking them despite the fact that they do not possess the subtlety or nuance or pacing of the classics. "Show, don't tell" kind of disappears: you are being told more often than you are being shown in these sorts of reads about how to deal with feelings and emotions, which can be off-putting to like-minded fiction buffs, but I feel like my readings in fiction led me here. This is in part because I was seeking counseling in my fiction: counseling I am not ashamed of reading self-help books, or of liking them despite the fact that they do not possess the subtlety or nuance or pacing of the classics. "Show, don't tell" kind of disappears: you are being told more often than you are being shown in these sorts of reads about how to deal with feelings and emotions, which can be off-putting to like-minded fiction buffs, but I feel like my readings in fiction led me here. This is in part because I was seeking counseling in my fiction: counseling in sadness, wisdom on relationships, insights into how to stay enriched in life despite how awful life can be. Fiction can do this for sure. But at some point I felt like the slow-drip of self-help for which I was exploiting fiction - and the pressure I was placing on the form of the novel to grant me these answers - was a means by which I was misreading fiction and doing a disservice to myself. It was time to seek the straight-dope answers from the scientists and to cease reading fiction as if I were grabbing it by the neck and demanding it give me the cure. There's no need to browbeat your writers with such presumptuous expectations. Though I don't want to read with only hedonistic motives in mind, trying to cull major life-tips from novel after novel can undercut the effect of pleasure and can sometimes to lead to a flagrant disregard of the writer's intent. I have probably allowed much of the literature I've read to elude me because I entered each piece with such myopic designs. It was time to purge that need out of my system by reading something more transparently grappling with bullet-point Emotional Assistance. Books pertaining to cognitive behavioral therapy and positive psychology are good for this; self-help books about immersing oneself in God are not. So I mean what most people mean when they say they like a certain genre. "I like jazz" means "I like a small fraction of it, but a fraction big enough to say I dig the genre." I am this way with my 3-4 self-help books. Now to get to the mechanics of the book itself: The Feeling Good Hanbook definitely reads like David Burns received a lot of feedback about Feeling Good, listened to it, and responded to it. The benefit to this is that his communications chapter and the sections that endorse a benevolent approach to receiving criticism are credible and authentic. These are practices that sound clean theoretically but very messy in practice, but given just how much Burns takes care to account for some of the criticisms given to him, one can tell he does practice what he preaches. The problem is one cannot necessarily tell from the "real-life stories" listed in the book, because the results are always SO good, and the sessions are always SO spot-on. In every example, the recovery process is expedited, conversations are summarized and filled of unconvincing and ham-fisted exchanges, and the stories all end with dramatic recovery and forever-changed lives. Because the narratives behind the examples seem too simplistic or overwrought, they come off as sounding too unrealistic, and the less credible the specific evidence, the more the reader will resist the thesis. However, I understand the point of these quasi-fictionalized accounts: they do put the thesis through a digestible and understandable "case study" which aides the reader, and, of course, they beat the salient points into the reader's skull. The relentless repetition is a necessary evil. First off, it is a book to both be read cover-to-cover and to be referred back to. Passages are repeated verbatim in different sections of the book, but they are passages worth reiterating even as a casual cover-to-cover reader. But most importantly, if it is a pertinent passage to two sections, Burns knows the reader may only refer to one section later. I can tell I will return to the book for guidance, and that is not a bad thing; it is a handbook after all, and a big one at that. Because it's a gargantuan owner's manual for a modern-day mind, it can get fatiguing, and sometimes the overexposure will make the information not stick. But Burns would be making a mistake to not drive some of these points home, especially since some are so counter-intuitive to our instincts or paradoxical in theory. The communication section is fantastic. The bits about emotional perfectionism - or rather, liberating one's self from the shackles of the pressure of being constantly happy - and emotophobia - needing to be happy because of the fear of being sad and the implications behind sadness - are terrific additions and great corrections to an omission from Feeling Good. I had felt like Feeling Good gave me the tools to manage distorted thoughts but eventually felt like it didn't help tamper a growing obsession with the management itself. It did not give warning that the exercises can get addictive and will not be a panacea. It doesn't really tell you to take the pressure off of yourself to feel good immediately after heeding its advice. My therapist had also said that mood management can become a very unhealthy obsession through which happiness can become more elusive. 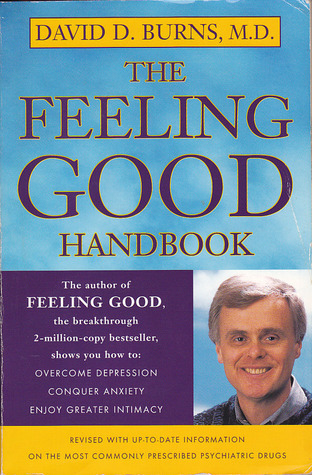 The Feeling Good Handbook understands that feeling bad often precipitates feeling good. You can feel good about your feelings, even if they're purportedly negative (angry, sad, etc). In other words, Burns took the principle to the next level. I appreciated that a lot, and it helped me catch myself in a bad habit. Do not read this book if you are severely depressed. This book has helped a lot of people -- people who are mildly or moderately depressed. For people who are severely or chronically depressed, not as much. I bought the book after three years of clinical depression and then had the book for four more years of depression, and I only got a few chapters into it. In fact, it really stressed me out. I took it to my therapist's office several times with me feeling upset, brokenhearted, like a failure, Do not read this book if you are severely depressed. This book has helped a lot of people -- people who are mildly or moderately depressed. For people who are severely or chronically depressed, not as much. I bought the book after three years of clinical depression and then had the book for four more years of depression, and I only got a few chapters into it. In fact, it really stressed me out. I took it to my therapist's office several times with me feeling upset, brokenhearted, like a failure, desperate, and hopeless. "This guy, Dr. Burns, says that if you just think differently, you can change how you're feeling," I said, shaking the book in the air. "He tells about all these people that are really depressed and that come to his office and then they aren't depressed anymore. He even says that in his opinion people who take medication for depression don't need to be taking medication, and that if depressed people would just follow Dr Burns' program here in this book, then their depression would go away. "What am I doing wrong? I've tried for years to change my thinking! Why can't I get better? He and my other CBT therapists say this is supposed to work, supposed to fix everything! But I've tried so hard!!! Is it just not hard enough? I would have killed myself years ago without medication, but he says I shouldn't have needed medication. I would have been dead many times over already without meds. But he says that essentially no one truly needs meds." I was very upset, in agony, near tears. "Perhaps," my therapist said in his usual calm, reassuring manner, "he is right -- about a certain group of people. Dr Burns is rather famous, especially in certain circles. Many of his clients may have gone to see him because a) of his reputation and b) they can afford his exorbitant prices. For instance, many may be rich wives who are feeling a little down because their cat died or struggling to communicate with their business-obsessed husbands or having relationship issues with their rich but insincere friends. They feel a little down, and if they've gone to their family practice doctor and gotten a prescription for prozac, they may not actually need the medication. They may benefit more from examining their relationships or thinking. Therefore, his clientelle may be self-selecting and not an accurate sample of the population in general." "Oh," I said, feeling less shame and more relief. "I guess that could be right. Maybe his claims are true -- for some people? They just may not be true for me? I'm not failing? I'm not just not thinking hard enough. I'm doing okay and I'm trying hard, and I need to set his claims aside as applying to someone else but not something I have to impose on my own life." "Right," my therapist said. "Your situation is VERY different. Years of depression, medications not working consistently, years of therapy and working on your negative thoughts and managing emotions, very severe and sometimes suicidal depression.... We've already seen that your depression is beyond just changing your thoughts, and your depression needs chemical regulation. So let's set this book aside. Dr Burns may not be seeing an accurate sample of the population, so we don't have to feel that this applies to you. You're doing a good job." A couple years later, I read that CBT and self-help books are wonderful -- for people with mild to moderate depression. For people with severe depression, CBT and self-help books can CAUSE MORE HARM. I found that to be true for myself. In severe depression, the chemicals and mood are so beyond one's control that medication is usually needed to reduce the symptoms and severity, and THEN the person can start to make progress in therapy. (Anyone who has been severely depressed knows what I'm talking about regarding inability to change thoughts or feelings at that point.) AFTER the symptoms are not so disabling, most people can indeed benefit from examining their thinking, as I did when my depression finally started getting better. My depression ended up being part of bipolar disorder. Bipolar depression DOES NOT get better by changing one's thinking! Medication is essential. Once I got on mood stabilizers, for the first time in 7 years I was not clinically depressed. At that point, I could actually make progress in therapy. Examining my thinking *actually caused changes* where before it was basically pointless discussion that my brain couldn't truly fix. محتوای قوی نداشت. اونجور که باید افسردگی رو به چالش نکشیده بود. مثل نوشته های زرد بود. فکر نمی کردم یه روانشناس انقد پیش پا افتاده بنویسه. از مسائل محدودی هم حرف زده بود. خوندنش توصیه نمی شه ازین که وقتم رو پاش گذاشتم عصبی و افسرده تر شدم. This is a great book for people with anxiety disorder. Contains some worksheets as well as great tips for making it through panic attacks. خوندن این کتاب رو به همه توصیه می کنم . این کتاب به شما کمک می کنه خطاهایی که در شناختتون هست رو اصلاح کنین و انرژی روانیتون رو ذخیره کنید . از اونجایی که همه آدم ها از این خطاهای شناختی دارن و باعث می شه حالشون بد باشه پس همه می تونن برای رسیدن به حال خوب از این کتاب استفاده کنن . البته این کتاب جای تشخیص و درمان روانشناسی رو نمی گیره و اگه کسی مشکلات حادی داره باید به درمانگر مراجعه کنه . SUCH a good book! I was given this by a friend who has shelves upon shelves of self help books, and I was very skeptical at first. To me, all self help books are just fluff, I mean can it be that easy to improve your life just from reading a book? YES! This book is pretty intimidating with its large size but it is absolutely chalk-full of amazing information and ways to deal with the everyday stresses of life. I will recommend this book to every person who wants to change their life for the bett SUCH a good book! I was given this by a friend who has shelves upon shelves of self help books, and I was very skeptical at first. To me, all self help books are just fluff, I mean can it be that easy to improve your life just from reading a book? YES! This book is pretty intimidating with its large size but it is absolutely chalk-full of amazing information and ways to deal with the everyday stresses of life. I will recommend this book to every person who wants to change their life for the better. I don't know. So far, I'm not finding this very helpful. Say it's the depression talking if you will, but I feel like I should be on the waiting list for the Oprah show when I'm reading this. I'll finish it... but I have a "good feeling" that $20 I spent on it would have been better used somewhere else. Overwhelmed? Stressed? Feel like you're ready to slide into a dark abyss? This is the book version of a cognitive behavioral therapy session with a psychiatrist. The examples, advice and exercises help you step back from your feelings, thoughts and behavior and take a clearer, more factual look at what's really going on in and around you. It's a tome at just over 700 pages and covers topics such as Why People Procrastinate, Social Anxiety and Five Secrets of Intimate Communication, all divided int Overwhelmed? Stressed? Feel like you're ready to slide into a dark abyss? This is the newer edition of THE book that was used in the clinical trials comparing antidepressants to cognitive-behavioral therapy, in which, believe it or not, they were found equally effective. I wish I had learned about this book in medical school! Not only have I found it extremely helpful on a personal level, but I can't think of a single person I've ever met who shouldn't read this book. What a helpful way of untwisting all the horrible things we and our minds do to ourselves. ممکن است روش خلع سلاح را نپسندید، زیرا وقتی کسی از شما انتقاد میکند، احساس خشم می کنید و صدایی در درون شما فریاد برمیاورد: حق با من است، حق دارم ازخودم دفاع کنم؛ اگرتسلیم این ندای درونی شوید و این وسوسه همیشه قدرتمندی است، تن به جدلی بی فایده و تقریبا همیشه بی سرانجام میدهید. بحث و جدل با انتقاد کننده تقریبا هرگز به نتیجه نمیرسد، اما در تایید منتقد حرف زدن همیشه موثر است و تاثیر جادویی دارد. See my review of the book. This is a great handbook and there probably is more info in it. But I would suggest that you don’t need this handbook. I think the book is plenty helpful and only $5 on Amazon. Just my two cents. This review has been hidden because it contains spoilers. To view it, click here. When I first read this book, it was difficult to understand. I was young without any comprehension of bipolar or why it was happening to me. Then, the concept on dealing with difficult people and "disarmament" was stated in this book. I read it, and then re-read it on how to disarm those who intimidated me. It worked perfectly when I tried it. I kept reading. I discovered that the tasks Dr. Burns asks of us should be viewed with a "trial run" or a "try it and see" mentality. In his previous edit When I first read this book, it was difficult to understand. I was young without any comprehension of bipolar or why it was happening to me. Then, the concept on dealing with difficult people and "disarmament" was stated in this book. I read it, and then re-read it on how to disarm those who intimidated me. It worked perfectly when I tried it. I kept reading. I discovered that the tasks Dr. Burns asks of us should be viewed with a "trial run" or a "try it and see" mentality. This book is not an attempt to hard sell. It is a sincere, genuine effort to provide us with exercises that really work. This I can say from personal experience. David D. Burns is a champion of Cognitive Psychology, and he has reached out to the general population with the simplest way with this book. This book is simply a must read, and practice. It is a classic. 727 pages. Donated 2010 May. Somehow I expected more. The book seemed kind of patronizing. Can't afford counselling? Well, they've actually studied this book and found it has clinical effectiveness very similar to a course of cognitive behavioural therapy. I found the bit about interpersonal communication especially helpful. Find the truth in complaints against you. Who knew? Stupid book gave me anxiety about how to fix my anxiety. I gives you a guilt trip in the beginning about not taking the exercises seriously enough. I got rid of it. this one is so good for me that its hard to read, if you know what I mean. It is a great book in that it give strategies and real world examples on how a self analysis can lead to chaning thought patterns which can lead to being happier. The reason I rated the book 4 stars and not 5 is that it only talks about one aspect of fighting depression and ignores other aspects completely. - good nutriti It is a great book in that it give strategies and real world examples on how a self analysis can lead to chaning thought patterns which can lead to being happier. It would have been OK to focus only on happiness by the right thought pattern. However, this not only means being more positive about yourself and your future, but also need to included lowering expectations! The thoughts you have, no matter how distorted, create your emotions- which feel real no matter how distorted the thought is. I love his notion on should statements, because setting yourself up for feeling like a failure usually starts with should statements. By using alternate wording you can significantly improve your thoughts and thereby your mood. I like his idea to write down the thoughts that led to the negative emotion, such as always or never statements. Then uncoil these distorted statem The thoughts you have, no matter how distorted, create your emotions- which feel real no matter how distorted the thought is. I like his idea to write down the thoughts that led to the negative emotion, such as always or never statements. Then uncoil these distorted statements and restructure the way you think about them, by using your rational thought. Then talk to your inner critic. An example would be if I thought nobody ever helps me clean the house and I am the only person who cares. Then I feel upset as the family plays and I clean and the upset builds until I am mad. I created this. So I would write down the thought, and then I would figure out which method of distorted thinking I used and then write my rational response. Am I really the only one who cares? No. Do people really never help me? The answer is no, so what is rational ? Going through this motion enough you should be able to stop distorted thinking in its tracks. Burns received his B.A. from Amherst College in 1964 and his M.D. 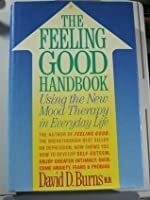 fro David D. Burns is an adjunct professor emeritus in the Department of Psychiatry and Behavioral Sciences at the Stanford University School of Medicine and the author of the best-selling book Feeling Good: The New Mood Therapy. Burns popularized cognitive behavioral therapy (CBT) when his book became a best seller during the 1980s.